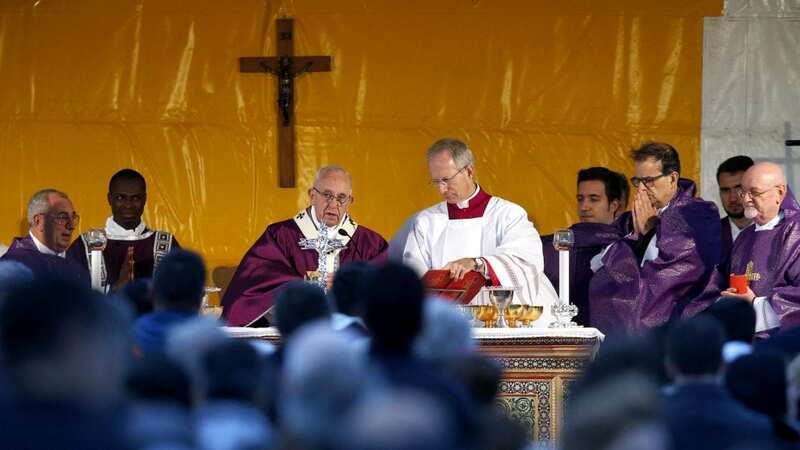 Pope Francis celebrates Mass on the feast of All Souls on 2 November at Laurentino Cemetery in Rome. Photo: Paul Haring/CNS. The Mass for the feast of All Souls is “realistic, concrete” in calling Catholics to remember the people and events of their past, to consider how they live today and to hope for eternal life with God and their loved ones who preceded them, Pope Francis said. Celebrating an outdoor Mass on 2 November, the feast of All Souls, in Rome’s Laurentino cemetery, the Pope said remembering “those who walked before us” is not only about the beloved dead, but also about remembering that each person has a history, a family and is part of something larger than themselves. Pope Francis arrives to celebrate Mass on the feast of All Souls on 2 November at Laurentino Cemetery in Rome. Photo: Paul Haring/CNS. With hundreds of people gathered at the windy cemetery where their loved ones are buried, Pope Francis pointed to the tombstones and the mausoleum behind the crowd, noting that they represent “the many people who have shared part of our journey”. Obviously, the feast day is more difficult for some people, including a weeping young couple the Pope met before Mass when he visited the children’s section of the cemetery and the “Garden of Angels”, an adjoining section for the unborn; parents who have experienced a miscarriage can opt to have their children buried there rather than having a hospital dispose of the remains. The image of the new, heavenly Jerusalem, he said, tells believers that “beauty awaits us”. People listen as Pope Francis celebrates Mass on the feast of All Souls on 2 November at Laurentino Cemetery in Rome. Photo: Paul Haring/CNS. Faith gives sure “hope that we will meet again, hope that we will arrive where there is that love that created us, where love awaits us, the love of the Father”. The feast of All Souls also includes a call to follow God’s path in order to live eternally with him. That path, Pope Francis said, is outlined in the Beatitudes in St Matthew’s Gospel. “These beatitudes – meekness, poverty in spirit, justice, mercy, pureness of heart – are lights that accompany us so that we do not take the wrong path,” the Pope said.